The Broil King Baron Black 440 is a large but basic gas grill that is well constructed, powerful, very capable, and should last for many years. Broil King, a family-owned company that has been open since 1906, is known for making superior grills, and this one definitely lives up to that reputation. The Broil King Baron Black 440 gas grill has a powdered-coated body, offering a lower price than the Baron 440 S, which is the same model but is made with stainless steel body parts. 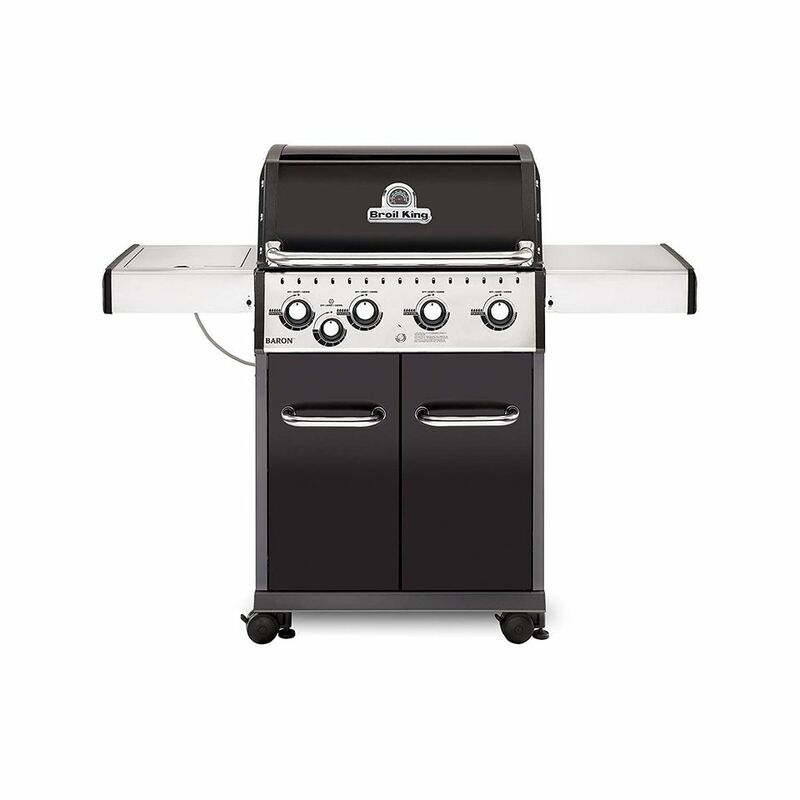 This four-burner gas grill has a small, low-powered side burner, a fully enclosed cabinet, and plenty of grilling space. The main burners are comprised of Broil King's Dual Tube made from heavy-duty, high-quality stainless steel. This patented feature creates double rows of flame per burner, providing more even heating. The two features that stand out on the Broil King Baron 440 grill are the dual tube stainless steel burners and the linear flow control valves. The dual tube burners equalize the gas pressure inside the burner so that the heat is even front to back. Standard tubular burners tend to have higher pressure in the front of the burner and can provide uneven heating—the Broil King burners correct this problem. The Linear-Flow control valves on this grill have 180-degree Sensi-Touch control knobs, as well as precise gas flow, allowing the user to accurately set the grill's temperature. Add in the four-burner design and this grill will let users pick an exact temperature from the very high to the very low, whether they are searing, roasting, or slow cooking. When it comes to this Broil King grill, there are more positives than negatives. This grill will last several years due to the quality construction, making this a smart investment. The cooking elements, from the dual-tube burners to the heavy porcelain coated cast iron cooking grates, allow for uniform heating front to back, assuring your food will be evenly cooked every time. And the Flav-R-Wave™ cooking system creates a flavorful vapor from the drippings that fall onto the stainless steel construction; the vapor then permeates the food, giving it that signature grilled taste. Offering convenience are the fold-down stainless steel side shelves—a flat surface when you need it, out of the way when you don't.